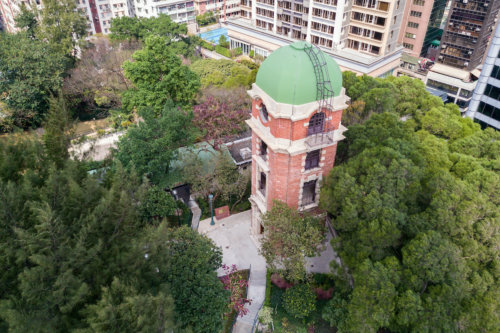 The Signal Tower in the Signal Hill Garden at Blackhead Point was built in 1907 by the Hong Kong Observatory to house a time-ball apparatus that was previously located in the nearby Round House of the Former Marine Police Headquarters. 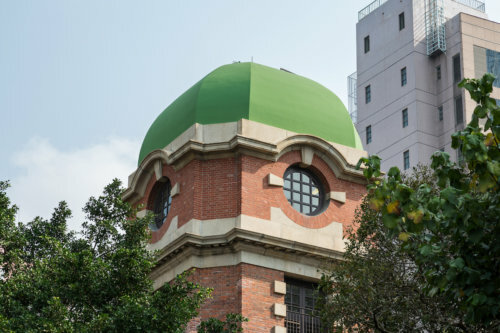 [Nick Kitto points out: the time-ball is still visible at the Marine Police Headquarters in TST. HF:Blackhead Point (黑頭山, lit. 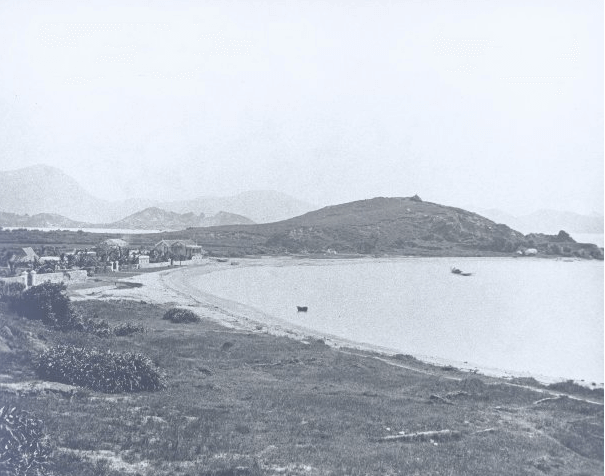 “black head hill”), also known as Tai Pau Mai (大包米), Tsim Sha Tsui Point or Signal Hill ( 訊號山), was a cape before land reclamation in Tsim Sha Tsui, Kowloon. It remains as a small hill almost hidden away behind Chungking Mansions , and is well worth a visit if you’re in Hong Kong. 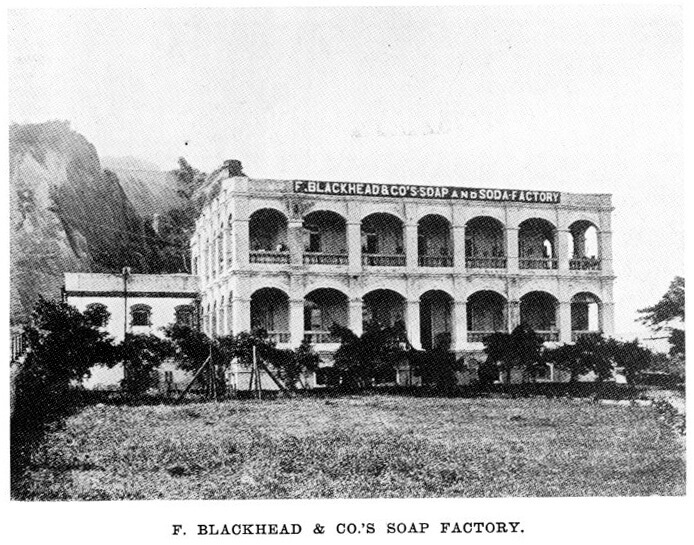 Blackhead Point was named after a German businessman in Hong Kong, Friedrich Johan Bertold Schwarzkopf, (also recorded as Berthold Friedrich Johann Schwarzkopf), who became a British citizen and anglicised his name to Blackhead during WW1. 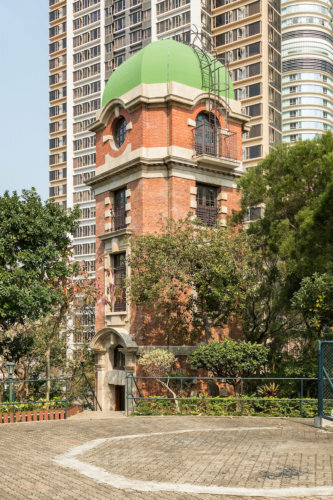 The Signal Tower was one of the two buildings constructed in Hong Kong for the purpose of signalling accurate time to the mariners and the public. The time-ball service resumed at the Signal Tower on 8 January 1908 and ceased on 30 June 1933. The Signal Tower has become a landmark feature of the Signal Hill Garden. From 1908 to 1920, the time ball at Signal Tower dropped once daily. Shortly before at 1 pm every day, the 6 feet diameter hollow copper ball was raised by hand-winch to the top of the mast, then at exactly 1 pm it was automatically released and dropped to the foot of the mast. From 1920 onwards, the time ball dropped twice a day at 10 am and 4 pm until 1933. Nicholas Kitto has very kindly sent the five photos below. Taken by Nicholas in March 2017 they are a small part of his superb collection of photographs which focus particularly on historical buildings in China and Hong Kong. For more information please see the link below. Signal Tower At Blackhead Point, Tsim Sha Tsui. The 109th Declared Monument. The Upper Level Of Signal Tower At Blackhead Point, Tsim Sha Tsui. 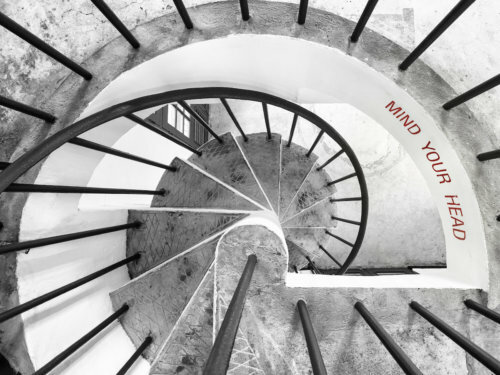 Looking Down The Spiral Staircase, Signal Tower At Blackhead Point, Tsim Sha Tsui. 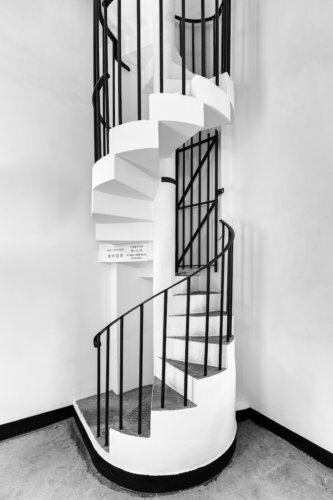 Internal Spiral Staircase, Signal Tower At Blackhead Point, Tsim Sha Tsui.